If you are in your 60s or older, I am sure you remember turning 50 and the Red Hat Clubs were very popular. There were even fabrics made to celebrate in red and purple. Sandy Gervais made adorable cartoon fabrics and the ladies at Great American Fabrics made some others that coordinated beautifully. I made myself a top (in my UFO pile – for this year) and so when my niece Janet approached the 50-year mark I decided to find some fabrics and make her one too. Fortunately, I had some fabrics left over, found some at Wooden Spools and on E-Bay. We share the same birthdate – just 15 years apart. She lives in Wichita and so does my brother and his wife, so my sister and I did a road trip last weekend to Kansas and I gave her the new quilt. I hoped it wouldn’t offend her and it didn’t, she loved it. 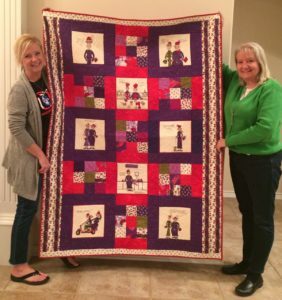 It is good to celebrate mile markers in our lives and what better way than with a quilt. I told you I have 6 UFOs on my New Year’s resolution list and I have finished the first one! 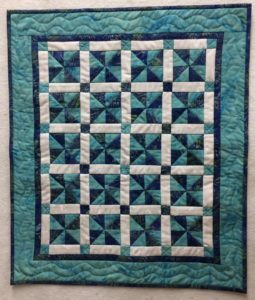 Of course, I chose a doll quilt because it was small and easy to finish. This was supposed to be for my granddaughter Freya for Christmas. 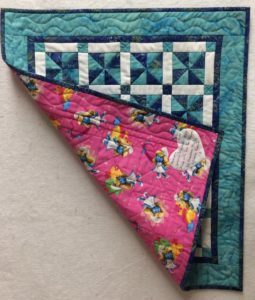 It is a Spinning Pinwheels quilt (18.75” x 22”) and the back has Smurfette fabric. I think now she will get it for Valentine’s Day instead of Christmas. It even has a heart shaped label. 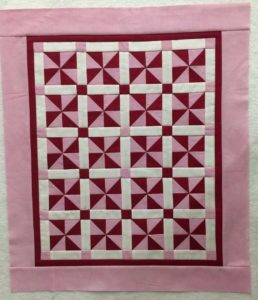 I loved it so much that it inspired me to create a pink, red and white version which I made into a pattern and will be available at Wooden Spools next week. It is called “My Heart is Spinning for You”. I just finished the top yesterday so now I need to get it quilted and hanging at the shop. Of course, it will look better with the little red binding around the outside. Look for it soon. By the way – how are your New Year quilt resolutions coming along? ← Letter B Sale Starts Jan 14th!